Will the S&P Fraud Case Be Just Another Wrist Slap for Financial Alchemy? The Department of Justice filed a civil lawsuit against Standard and Poor's for fraud. Will the DOJ finally nail credit rating agency Standards and Poor's for slapping AAA ratings on rigged CDOs backed by mortgage toxic waste? Or will justice be just another slap on the wrist? 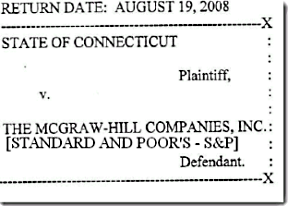 Read more about Will the S&P Fraud Case Be Just Another Wrist Slap for Financial Alchemy? S&P projects Belgium will end 2011 with general government debt at around 93% of gross domestic product in net terms, and at around 97% of GDP in gross terms. 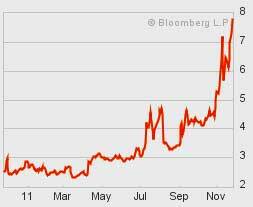 Italian bond yields hit 7.8% and that's a 14 year high for borrowing costs and a doubling in a matter of days. Unlike the Fed, Italy cannot print up more Euros either to take care of their problem. The Italian Treasury paid 6.504 percent to auction 8 billion euros ($10.6 billion) of the debt, almost twice the 3.535 percent a month ago and the highest since August 1997. Italy’s two-year bonds yielded a euro-era record 7.83 percent, almost 50 basis points more than 10-year notes. Yesterday Moody's cut Hungary to junk status. Junk means not ready for prime time, or investment. Brought to you by Politicians - Joke's on you huh! break out the O.J....hang out with the pooch...time to check out the money funnies. and a thrill seeker understand the nature of the ride’s operations. The rationale of “who could know?” is wholly undone through even a cursory examination of the actions of Moody’s and other financial players in the structured finance sector. Moody’s and other financial players took care to protect their earning should the real estate bubble that they were ushering into the world subsequently collapse. Who in the World would trust Standard and Poor's? "A third official says that S&P made a "serious mistake" in its analysis, "based on flawed math and assumptions," so the Obama administration is pushing back. But even though "S&P has acknowledged its numbers are wrong, it's unclear what they're going to do.," the official said. "S&P's numbers were off by "roughly $2 trillion," the official said. Fitch and Moody's reaffirmed the AAA US rating earlier in the week. In addition to the question raised about a mathematical error, there are substantial reasons to doubt S&P for any credit rating, let alone the sovereign debt of the United States This material is from an article on April 25, 2011. It is highly relevant to the situation at hand. Read more about Who in the World would trust Standard and Poor's?